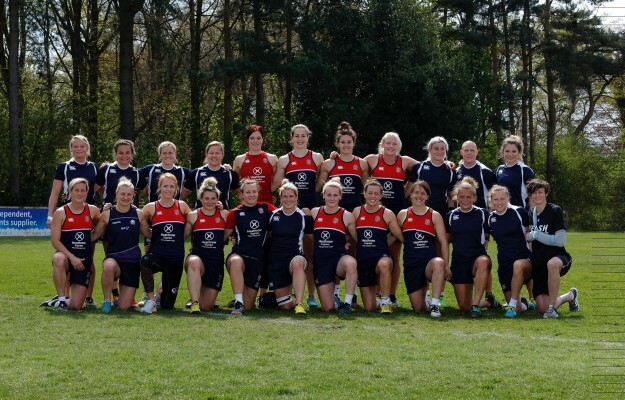 Our blogger Amy Wilson-Hardy tells us more about Great Britain's lead up to Rio and a change of scenery for the squad in the north of England. We're travelling up the M1. Windscreen wipers on full whack. Three hours in and the weather does not seem to be shifting. Typical for the north right? We are travelling up to Hull, specifically to Bishop Burton College for an intense three-day training camp which will culminate with three games against the college's sevens boys. It's a change of scenery. A chance to escape from our normal routine and avoid the risk of monotonous training. An opportunity to grow as a team and conquer some mentally and physically challenging sessions together. After a good night's sleep, we open the curtains to glorious sunshine. It's no secret that the weather makes or breaks these kind of camps. Our nutritionist Mike has obviously done a great job telling the kitchen staff what we like, as breakfast is a fantastic spread of, amongst other things, smoked salmon, runny poached eggs and spinach. The drive to Bishop Burton College takes us through some idyllic villages. It is great venue for us, with well-maintained pitches and the staff always happy to help. Day one contains two rugby sessions, split up by a compulsory coffee in the cafe where Midds (head coach Simon Middleton) claims there are "The best scones in Yorkshire!" Training consists of lots of decision making drills and conditioning games. Handing skills are always a massive feature in sevens training so every sessions starts with a variety of different set ups, from short pop passing to pitch width passes in groups. On day two, Charlie Staite from BBC Breakfast joins us for training to get an insight into our journey to Rio. He is quick to get involved in one of our decision making drills, tries his hand at being lifted in a lineout and even volunteers to be taken out by the one and only Heather Fisher. Fortunately, you'll be pleased to know he made it back to his anchor slot on Breakfast the next morning, although I'm sure he was feeling Fisher's hit that sent him flying to the floor. We looking forward to seeing the final edit when broadcast in July. Before we know it, seven sessions have been completed and it’s time to dig deep for three, 20 minute games against the boys. It will be a real test for us, as they are a successful side with pace to burn. RFU coach Sarah Cox, who has been with us the whole week, dictates the rules to both sides and we’re off. The lung burn kicks in as we are pulled around the field, but we do well holding our shape and get some good returns from our attacking plays. It is a different challenge to the one we come against on the World Series, but a valuable experience nonetheless, upping the intensity at which we play and creating different pictures for us to adapt to. The training camp concludes with a brilliant social organised by our fellow team mates. Natasha ‘Mo’ Hunt has sorted a three course meal at a casino, with a £5 chip included in the deal. As we wait to be registered, it seems we have chosen OAP night with even the staff looking too young to be present! Fortunately, when we get in, that is not the case and we enjoy some excellent food and subsequently try our hand at gambling. Being very inexperienced when it comes to roulette, I am shocked to see one lady spread out £1,000 in notes and lose it in the space of five minutes. Therefore when I make £15 from my free chip, I make a run for it, happy with my small profit! There are some tired bodies as we head back home. As Rio gets closer, it is easy for the pressure to take over, with performance, staying fit and selection dates becoming ever more important. We are all fighting for the same goal and the reality is, some of us will not get there. These camps provide an opportunity to really focus and improve, in addition to growing the sense of togetherness that is integral in a squad. We have achieved a lot in the last few days, but our most unexpected achievement is undoubtedly our tan lines, from Hull of all places!